*Must mention this offer to receive discount. New patients only. Includes comprehensive exam and all necessary x-rays as determined by provider. May not be combined with any other offer, discount, insurance, or reduced-fee program. ADA 0150, 0210, 0272, 0274, 0330. 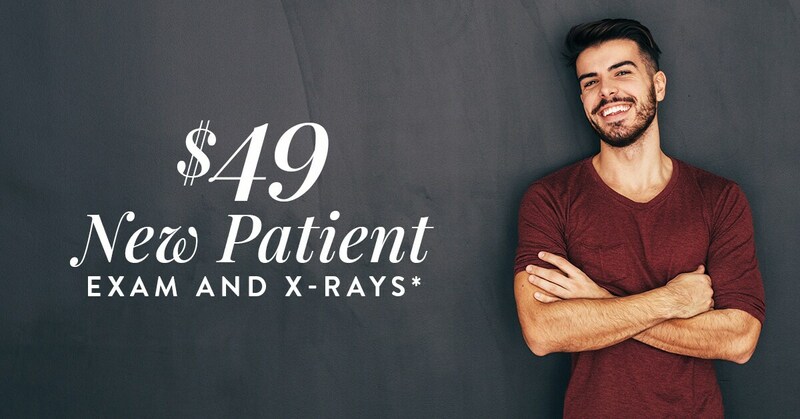 THE PATIENT AND ANY OTHER PERSON RESPONSIBLE FOR PAYMENT HAS A RIGHT TO REFUSE TO PAY, CANCEL PAYMENT, OR BE REIMBURSED FOR PAYMENT FOR ANY OTHER SERVICE, EXAM OR TREATMENT WHICH IS PERFORMED AS A RESULT OF AND WITHIN 72 HOURS OF RESPONDING TO THE ADVERTISEMENT FOR THE FREE, DISCOUNTED, REDUCED-FEE SERVICE, EXAMINATION OR TREATMENT. LIC# 13483, 18083, DN17541, 20050. Expires 04/30/2019. Our goal is to provide you with the most comprehensive dental care. Call us today at (954) 246-4835 or book an appointment online.